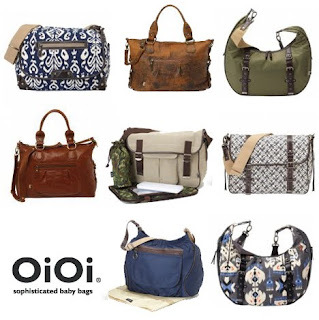 ellehermansen: OiOi: Sophisticated Baby Bags! It's been a little difficult to review a few things before actually putting them to good use, but now that baby Edie is around, she is helping me give the "thumbs up" to a couple of great products! When I found out I was pregnant, one of my first and possibly most shallow of thoughts was; "Will I have to lug around an ugly diaper bag now?!". As I am a huge lover of fashion, this was sadly becoming an "issue". 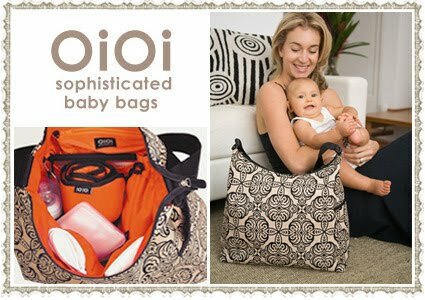 After much reviews, I came across OiOi baby bags, hailing from lovely Australia (read the OiOi story here), this mother knew how to merge fashion and practicality. It was difficult picking out a bag as they are all so beautiful, but I had to think of the husband, who wouldn't be caught dead rocking a pink frou frou type of bag or anything too feminine. So I picked a happy medium, which was a gorgeous black, quilted-styled bag. The wonderful thing about these bags is not only the fact that they are roomy, but they have a place for my keys and my cell phone. They also come with a roll-up changing pad, a bottle warmer, and a plastic wipe holder case for the wet nappies. It even has extra straps inside, so you can place it on your stroller or buggy perfectly! If you are looking for something lovely, gorgeous and useful - I would definitely concider the OiOi baby bag. You won't be disappointed! Check out more of their beautiful bags, here! I hate shopping. Abhor it. But you make me want to buy my daughter one of these bags. OiOi and the others whom you have given plugs should pay you for your posts.